Guild Starfire Bass II Model Semi-Hollow Body Electric Bass Guitar (1968), made in Hoboken, NJ, ebony grain laquer finish, laminated maple body, laminated maple neck with rosewood fingerboard, original black hard shell case. The 1960's Guild Starfire bass has gained attention as one of that decade's most distinctive bass guitars, and the early double-pickup Starfire II model is the most sought-after version. Despite a general resemblance to the more common Gibson EB-2 and Epiphone Rivoli, the Starfire is a completely different animal sonically, putting out a very clear and powerful sound with a wide frequency range and almost piano-like growl unusual in a hollow body bass. Starfire II basses, which from this period are much rarer than the single pickup Starfire I, became a prominent part of the San Francisco sound in the late 60's with both Phil Lesh of the Grateful Dead and Jack Casady of the Jefferson Airplane choosing the model for their psychedelic explorations of the low end. With a very slim and fast-playing neck, the Starfire is the perfect bass to "take off" with and remains as unique as when first designed. Guild did not even enter the electric bass arena until 1965, when the semi-hollow double-cutaway Starfire line and the solid body line both had a single-pickup bass added. 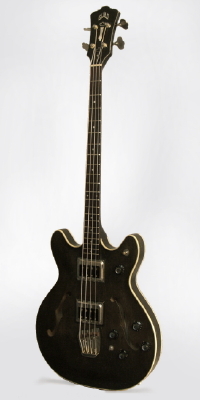 While the solid body Jetstar crashed and burned, the Starfire Bass soon became one of the company's most popular items. The body is not fully hollow; there is a solid block running through the center in the manner of an ES-335, giving a tighter response than a true hollow body bass. The real secrets to the early Guild basses' unique sound are the large Hagstrom-made Bi-sonic pickups, which look like double-coil unit but are in fact more akin to a giant DeArmond Dynasonic. With large magnet slugs for polepieces, this pickup has a very powerful attack and a broad harmonic range quite unlike either the more familiar Gibson bass humbucker or the Guild humbucking pickup which replaced it around 1970. The double-pickup Starfire II was added to the line in 1967; it carries a rather lavish electronics package with a master volume control, pickup selector switch, individual tone and volume knobs for each PU, and a pushbutton "baritone" switch which cuts low end on the neck PU. The chrome Hagstrom bridgeplate is extended on the treble side to allow for longer saddle travel; it also looks rather more like Guild's traditional "harp" tailpiece in an attractive if possibly unintended touch. This particular Starfire II is from mid-1968, with an unusual ebony grain finish that is a catalog option but is rarely seen. Nearly all Starfire Basses were cherry or sunburst -- this custom order finish is noted on the label as "Starfire Bass II Ebony". This bass is all original and a fine and most unusual example of this 1960's classic. The sound is extremely well-defined and powerful, and this is one of the most sonically versatile basses of the 1960's. Playability is excellent and we are most pleased to offer this fine example of what has been one of out most frequently requested instruments. Overall length is 45 7/8 in. (116.5 cm. ), 16 3/8 in. (41.6 cm.) wide at lower bout, and 1 7/8 in. (4.8 cm.) in depth, measured at side of rim. Scale length is 30 3/4 in. (781 mm.). Width of nut is 1 1/2 in. (38 mm.). Well-played but not abused. All original finish; overall quite well-preserved but considerable wear to the back of the neck, some buckle wear to the back, and a spot of finish inexplicably worn away between the jack and tailpin on the rim. Top is slightly faded but has only small areas of wear. All parts original except one bridge saddle is a repro (original included) and the small master volume knob is replaced by a larger period-correct Guild knob. Some noticeable wear to the plating on the pickup covers. Generally Excellent Condition.